Courtesy of Phil White, Lake Memphremagog, California. 50-year-olds and 60-somethings dominated the long courses of the Kingdom Swim this year, winning the 25.7 km Border Buster and the 10 Mile U.S. Masters Swimming National Open Water Championships. The winners received some of the most unique awards in the open water swimming world. Charlotte Brynn, 50-year-old Kiwi who runs the Swimming Hole in Vermont, took home the jerky and a hand-carved walking stick by finishing the Border Buster in 7 hours 55 minutes. She was trailed by two COWS (Chattanooga Open Water Swimmers), 39-year-old Karah Nazor of Chattanooga Tennessee and her 31-yar-old teammate Jamie Ann Phillips. 56-year-old Bill Shipp, a frequent winner in Lake Memphremagog, took an early lead as the field swam across the American-Canadian border, but was overtaken by 58-year-old Ned Denison of Cork, Ireland. Shipp regained the lead after they crossed the international border back into the United States, finishing in 8 hours 18 minutes while Denison finished 30 minutes behind. Third among the men was another 50-something Patrick McDermot with a time of 9 hours 3 minutes. 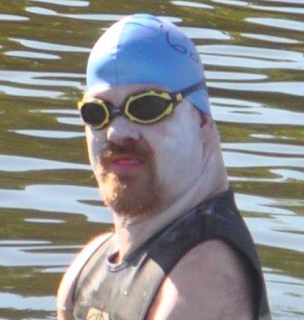 The U.S. Masters Swimming 10 Mile National Open Water Championship was also dominated by the elders. 55-year-old James Biles of Wisconsin was the overall winner with a time of 4 hours 10 minutes with 36-year-old Stephen Roach in second. In addition to his U.S. Masters Swimming medal and official patch, Biles also received a hand-carved walking stick, some beef jerky and a quart of maple syrup. Close behind was second-place finisher 57-year-old Guy Davis and 42-year-old Christopher Graefe. 51-year-old Laurie Hug of Pennsylvania claimed a walking stick, beef jerky, and syrup with her 10-mile winning time of 4 hours 25 minutes 32 seconds. Close behind her were two 60-year-olds, Nancy Steadman Martin in 4 hours 26 minutes 17 seconds and Shirley Loftus-Charley. Both the male and female winners in the Border Buster and 10-mile national championship races also each received a six pack of day tickets to Burke Mountain for use this coming winter. The male and female winners in the 1-, 3-, and 6-mile courses each receive a four pack of day tickets to Kingdom Trails in East Burke. While the older swimmers dominated the award podium, there were other highlights. "Winning our hearts were two swimmers," described Phil White. "12-year-old Vera Rivard of New Hampshire swam in the 10-mile non-championship wave because of her youth and finished in 5 hours 4 minutes. Her time beat over half of the swimmers in the 10-mile course." And 41-year-old Craig Dietz, also known as the Limbless Waterman, joined the ranks of marathon swimmers after he completed the longest swim of his life, the 10 km in a time of 4 hours 12 minutes. Dietz uses a flipper attached to his left leg stump, undulating on his back and sighting off his kayaker Laura Dolgin. "His longest swim prior to this was the 4.5-mile Chesapeake Bay Swim," explains White. Dietz said, "My competitive nature prevents me from ever being fully satisfied with time. But, considering that this was the longest swim of my life, and I lost two months of training this spring to an inner ear infection, I'm pretty happy with a 4:12:35." "We must also give special mention to our 70-something swimmers, Paul Epstein of Weatogue, Connecticut who is the most mature swimmer to complete our 10-mile swim without a wetsuit. Bravo. And my friend 73-year-old Curtis von Kann from Washington, D.C., one of the elves of Cove Island who ring their cow bells as we swim by. In the first year of Kingdom Swim, Curtis was so excited to see the 10 milers swim by that he jumped in the water and started swimming to Newport. Since then, he’s been swimming the one mile course every year. ."
White reminisces about his event. "Kingdom Swim is now in its eighth year. The 10-mile swim has been sanctioned by WOWSA for several years. This is the first year Kingdom Swim has hosted a U.S. Masters Swimming National Open Water Championship. 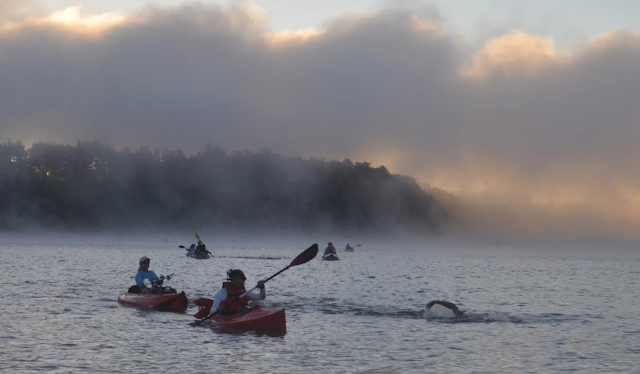 This year approximately 150 swimmers and about 140 kayakers participated. They travelled from California, Colorado, Connecticut, Washington, DC, Florida, Illinois, Indiana, Ireland, Louisiana, Massachusetts, Maryland, Maine, Missouri, North Carolina, New Hampshire, New Jersey, New York, Ohio, Pennsylvania, Quebec. Rhode Island, Tennessee, Virginia, Vermont, Washington, and Wisconsin."